Unlike in European cities, in Russia’s capital there are relatively few boat restaurants and hotels, which is largely due to the complexities of the relevant regulations. Yet there are boat restaurants moored not far from the Kremlin whose owners pay the city not more than 1 cent per square meter. RBTH found out more. Visit any one of the great European cities situated on a river and you will find numerous floating restaurants, bars and nightclubs moored alongside boat hotels. Yet there are surprisingly few such establishments to be seen in Moscow, despite the fact that the Moskva River runs for many miles right through the city center. Boat restaurants and hotels first appeared in Moscow in 1991. The pioneers among them were romantically named after great Russian poets of the early 20th century. To begin with, the mayor's office authorized the conversion of the steamer Valery Bryusov into a hotel. Next followed the boat hotel Alexander Blok. However, then the process got out of control as the Moscow city authorities simply lost sight of the situation with the floating real estate and some smart investors promptly took advantage. At the time, one could rent a square meter of the Moskva River for 36 kopecks ($0.3). By way of comparison, one square meter of office space cost $300-500 a year. As a result, by 2001, there were already some 40 landing stages installed in the center of Moscow. 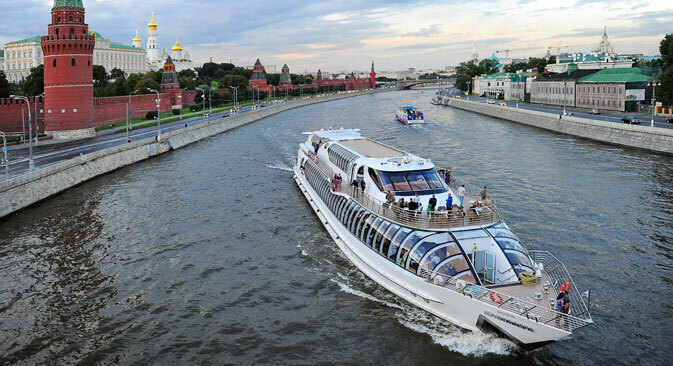 These are the origins of the floating restaurants and business centers on the Moskva River. However, in 2006, the then-mayor of Moscow and one of the most prominent Russian politicians of the time, Yury Luzhkov, declared a war on landing stages and promised to rid the city of them. "We shall remove these ugly structures from the Moskva River. The river should be nice and clean," he announced. The city administration then resorted to some drastic measures: It cut all boat restaurants, hotels, etc. off from the water supply and the sewer system. In response, river business owners sued the mayor's office and some of them even managed to win, though in the majority of cases, the city authorities won. The first landing stage was dismantled in August 2007, while their total number dropped from 140 to 26 over the course of the next two years. Unlike in Europe or the U.S., there are hardly any houseboats in Russia. "Houseboats are a purely European thing so far. There are successful houseboat development projects in some European cities, like Amsterdam, whereas here this sector of the real estate market is practically non-existent - and for the time being there are no signs that things may change," says Yulia Barakhtina, head of the Bekar real estate company. According to her, there are practically no instances in Russia when landing stages have been used for housing. However, there have been some exceptions. In particular, ZIP Realty managing director Yevgeny Skomorovsky recalls that former construction tycoon and ex-head of Mirax Group Sergei Polonsky, who is currently hiding in Cambodia, used to live on a landing stage in Moscow. "The main type of business that landing stages could be used for is catering, and mainly in large cities with a prosperous population, or in tourist resorts, like Sochi," says Yulia Nikulicheva, head of strategic consulting at JLL. According to her, one of Russia's biggest restaurant holding companies, Ginza Project, would be interested in developing projects like these. However, so far most of these projects are being carried out outside Moscow. "In Moscow, this business is being targeted by an unjustified and ruthless persecution. Overall, this business is barely developed in Russia, although there are some individual examples of boat hotels in Yaroslavl and Kolomna," says Stanislav Ivashkevich, CBRE deputy director for developing the hospitality industry. The aforementioned towns form part of the so-called Golden Ring and are just three to four hours away from Moscow. The boat hotel in Kolomna is called Arbat, while the one in Yaroslavl is called Volga Pearl. The city where various forms of river-based business, including water taxi, have historically been quite popular is St. Petersburg, given the number of rivers and canals, which are an integral part of the life in the city. After Luzhkov left his post in 2010, new landing stages began to appear on the Moskva River too. For example, in 2013, 15 new landing stages were registered with the city authorities. Furthermore, the new Moscow city administration at first announced that it did not have any objections to floating businesses. By 2018, they planned to have a total of 200 landing stages, housing hotels and restaurants in the city. The mayor's office began to offer ready locations for landing stages, with 2,500 square meters available to rent until 2019 or 2027 for $600,000-900,000, depending on the location. However, the new rules do not apply to already existing barges and landing stages: Those who managed to survive in the war with mayor Luzhkov still pay the city a mere 1 cent per square meter. According to Blackwood managing partner Konstantin Kovalyov, the current procedures for having a landing stage installed are very complicated and involve a lot of red tape. To begin with, you need a special license, an agreement for the use of bodies of water and a water lease agreement. Additionally, each regulator has its own requirements. Even more confusingly, in April 2014, the Moscow city authorities had another change of heart as far as landing stages are concerned. According to Deputy Mayor for Transport Maxim Liskutov, Moscow is once again preparing to dismantle them.